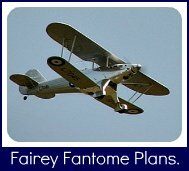 Build from model aircraft plans of the Fairey Fantome. 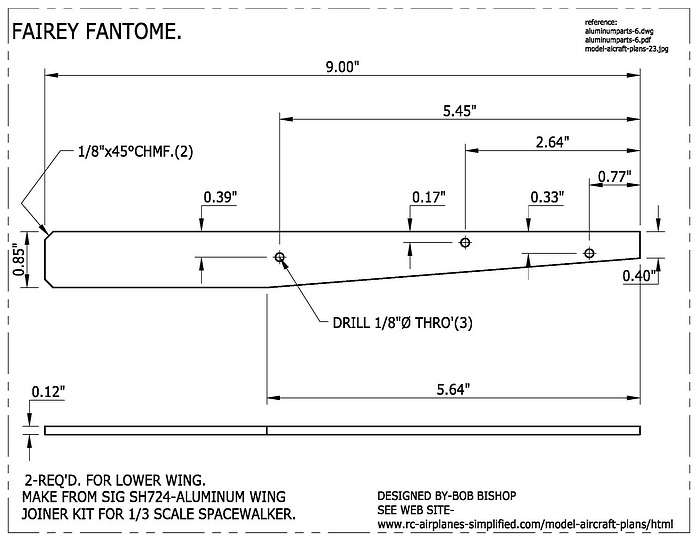 RC Model aircraft plans of the Fantome are available. Photos and tips from the designer, and downloadable, PDF files of the muffler and hardware. Designing RC model aircraft plans, is a project I really enjoy! 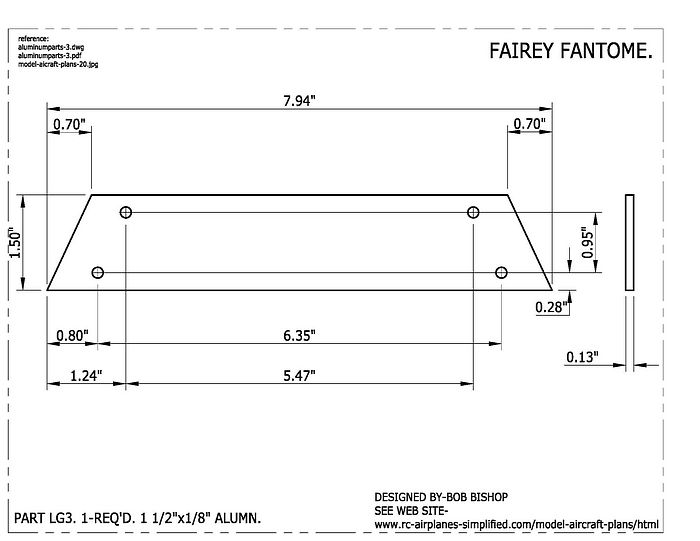 I spend a LONG time on the CAD drawings and I find I am constantly updating them, with improvements. I have built a few models from plans and from this learnt what was missing and have tried to incorporate this knowledge into my designs. 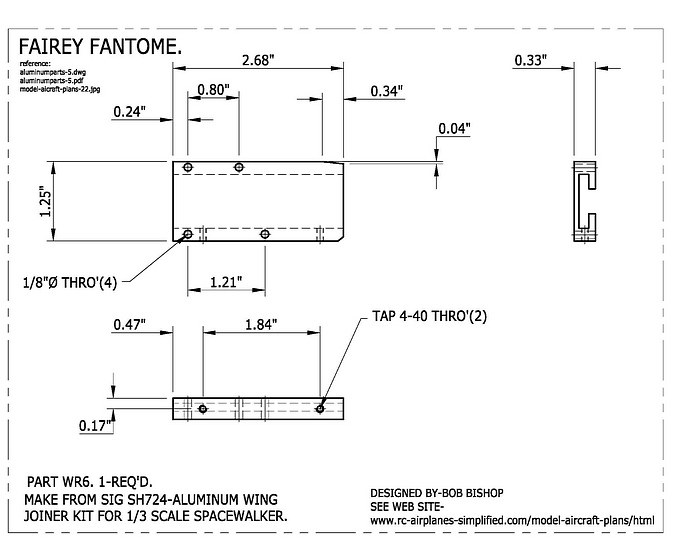 I loved the looks of the Fantome and starting looking for documentation and had a tough time finding useful information. I did hear of an article that was published in an old edition of the monthly magazine "Aeroplane" and I was lucky enough to find a copy. (December 1975 edition) The article is very useful with a few nice photographs and a 3-view, that includes fuselage cross sections. I did come across the drawing below, during a search on the web. This is an excellent drawing but unfortunately, I can't remember where I found it, so cannot give the source credit! 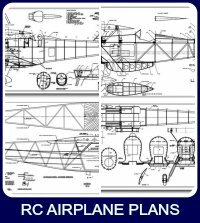 If you click on the drawing, you will find a PDF file, that can be downloaded and this should help, during the build, from the model aircraft plans available here. Click on the above image to download a PDF file. 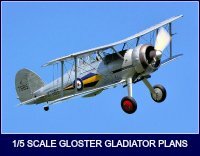 It was decided to build the plane to a scale of approximately 1/5 and the exact multiplier was chosen, so as standard size spinner and wheels could be used. The actual scale is 1/4.825. Wing area: 1804 sq. in. Wing loading: 29.4 oz./sq. ft.
Top wing incidence: +2 deg. Bottom wing incidence: +2 deg. Bottom wing dihedral: 4.5 deg. Top wing dihedral: 0 deg. This is the engine used in the original model. 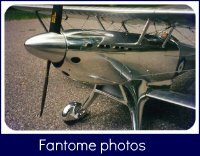 This is a very reliable engine, that has flown the Fantome well. I did pay attention to the cooling of the motor, via the cooling duct.﻿ See drawings on this page. Click here to visit the Moki web site. For a list of world wide representatives, take a look here. I use only FAI fuel( no nitro) and I have found the O.S "F" type plug to be be very reliable. Here we have a copy of the model aircraft plans, showing the nose section. You can see that the Moki is a tight fit, along with the custom built muffler. If you click on the drawing, or here, you will see the PDF file, that you should be able to download and print. I have included a scale, so you will be able to measure the drawing or change the scale to print full size on an 8.5" x 11 in. sheet. This drawing. 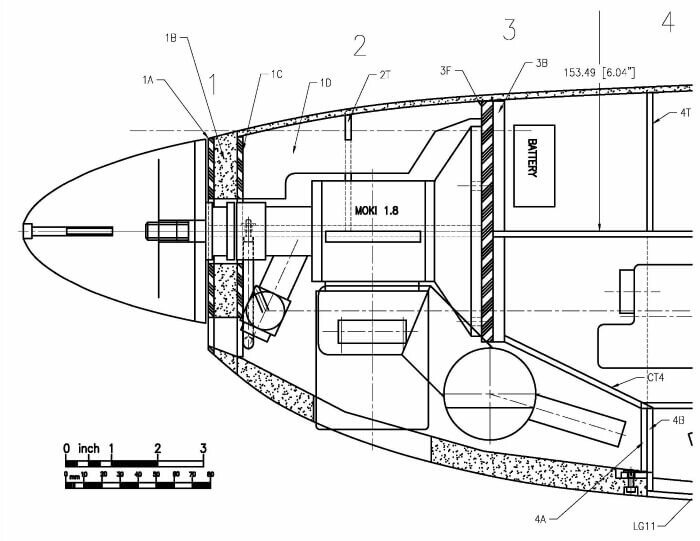 from a part of the model aircraft plans, takes a look at the cross sections through the cowl and engine. You will notice that it was necessary, to tilt the Moki through 10 degrees, to squeeze it in and still give enough room for cooling air. Once again you can download a PDF file and see if you can use the engine of your choice. 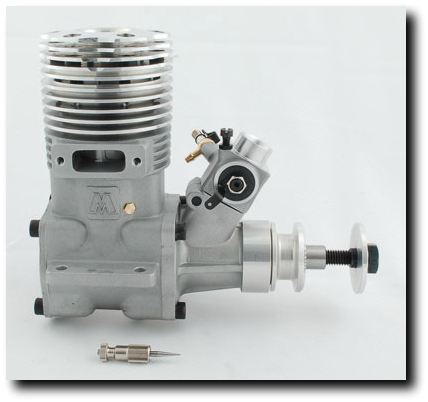 For all you gas engine enthusiasts, Moki now offer a gas version of the 1.8. (Model # G180RC). This photo shows this model. The crankcase and head appear to be identical to the glow version. The obvious difference is the Walbro carburetor. It may just be possible to make this fit. The same radial mount could be used and maybe even the muffler. The HP is quoted as identical, but maximum RPM is a little lower. You may have to play around with different props, to equal the thrust of the glow version. I use an 18x10 prop. on my model, that spins at 7.400 RPM. Moki do offer a 2.1 cu.in. size engine, that is identical in outside dimensions to the 1.8 cu.in. Unfortunately, they do not, as yet, offer it as a gas engine. If they did , then this would be the ideal gas engine for the Fantome. I do use an onboard glow. It is an inverted installation and the greater reliability of this, combined with an O.S. "F" type plug, has given the minimum of problems. This is the second DLE-35RA that I've purchased. Easily hand propped to start. Choke it until it pops. Flip it a couple of time more and away you go. Carb settings out of the box were perfect for an 18-8 wide blade APC. This engine pulls like a train. Low idle and reliability are best quality. Plane I used this in are a H9 35cc Beaver and a H9 35cc Ultrastick. 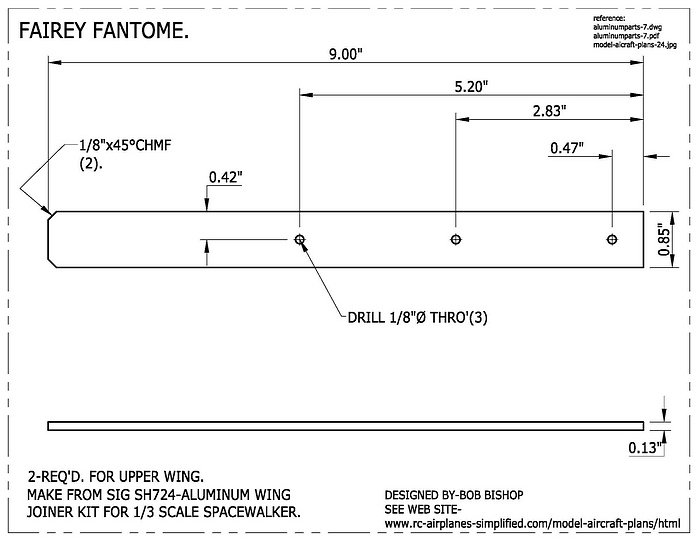 This engine is intended for tighter cowls and the Fantome certainly qualifies! The rear exhaust and muffler make a compact installation and works well. Comes complete with electronic ignition, muffler,spark plug, manual and 4 stand-offs for mounting. 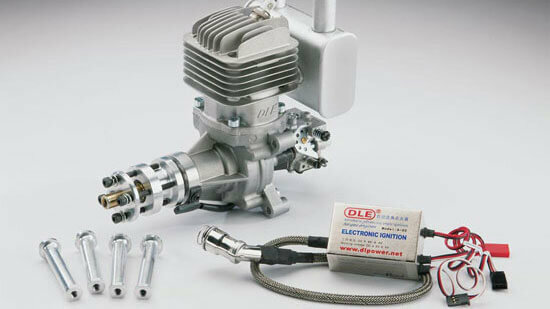 Price of the DLE 35RA 35cc Gas Engine is-$349.99 with FREE shipping in U.S.A. If you are still having problems figuring out if your engine of choice will fit, please contact me. 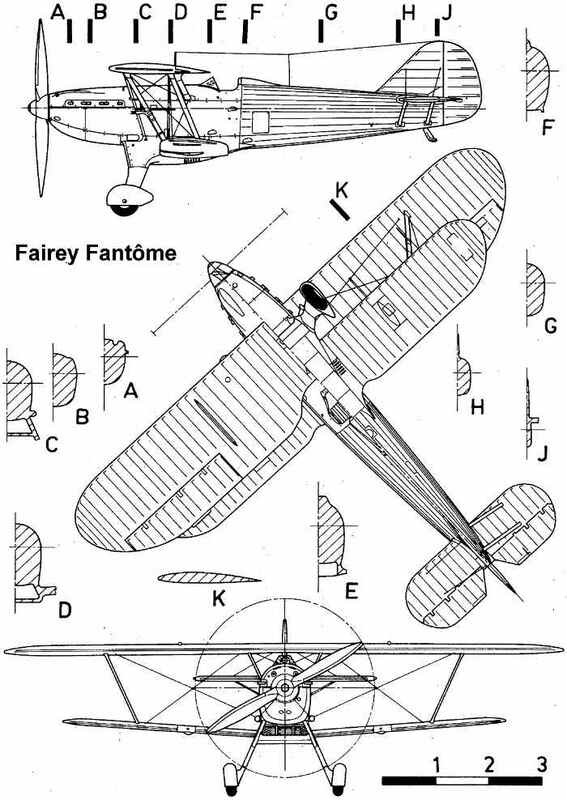 I will take a close look at the original model aircraft plans and give you advice re your chosen engine. A big advantage of designing your own model aircraft plans, is that you can solve a lot of problems, at the design stage. It soon became obvious, that a standard muffler, would not fit, into that streamlined nose! So a call as made to Bisson Custom Mufflers, and after talking the application over, it was decided to design a special. 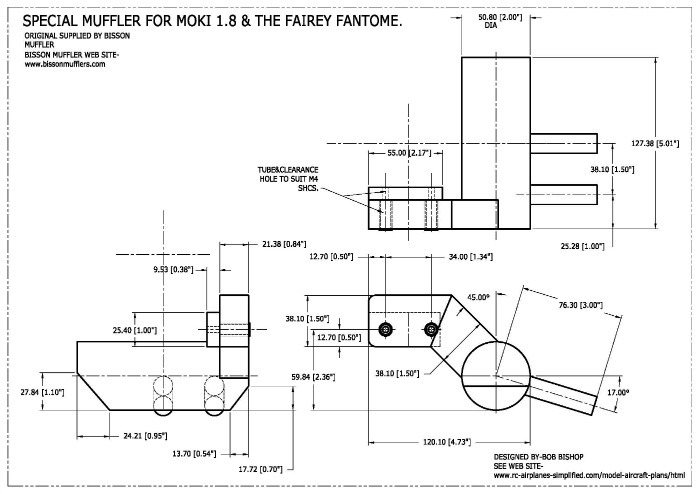 This drawing of the muffler for the Moki 1.8 is taken from the model aircraft plans of the Fairey Fantome. This design, was custom built by Bisson Custom Mufflers. It is NOT listed as a standard, so you will have to send them a copy of this drawing, if you would like one made. You can download a PDF file, by clicking on the drawing or here. After contemplating a few different ideas, on the model aircraft plans, for landing gear design, it was decided that a spring loaded strut would be the best solution. 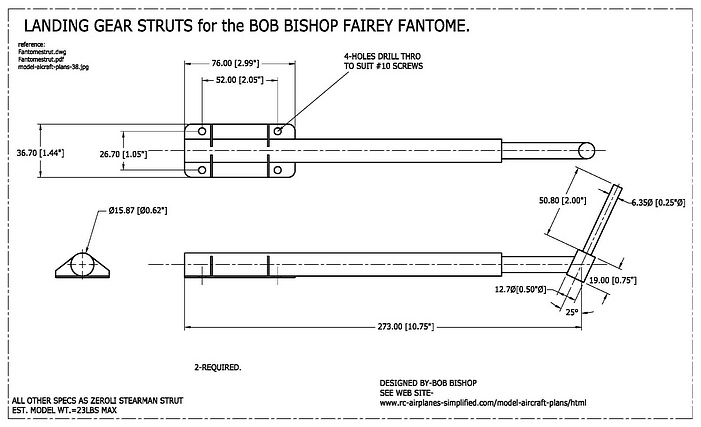 I had previously built a Ziroli Stearman and liked the Robart strut design, so a strut, especially for the Fantome was drawn up. It was basically the same strut, the main difference was in the mounting flange design. Click on the drawing to see the PDF file. This link to the Robart site, will give you full details of the Ziroli strut. 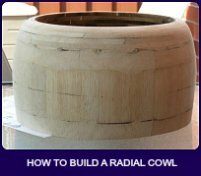 Contact Robart to see if they can build this special. The cabanes are made from aluminum, by TNT Landing Gear. This is a custom made unit and you can send them a copy of the PDF file, or fill in the special form , from their web site. The PDF file can be viewed and down loaded, by clicking on the drawing, or here. You will notice that the strut is in two pieces. This allows it to be removed, from the fuselage hatch, which makes finishing the hatch a lot simpler. 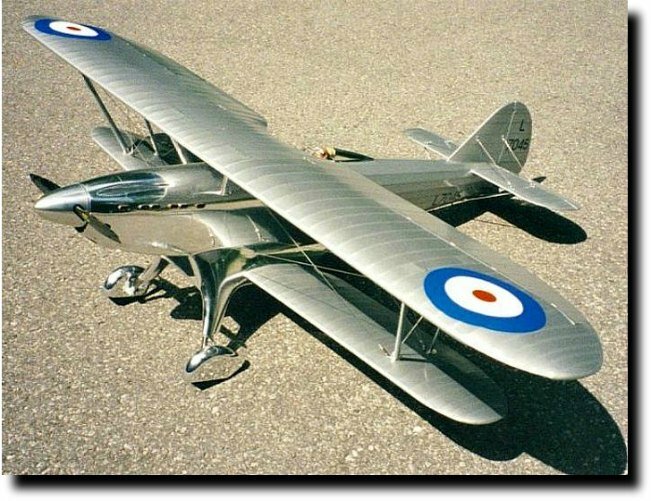 Take a look at the model aircraft plans for more details. Also note that balsa fairings are added, to make a streamlined section. (See model aircraft plans, sheet 2). I also built into this fairing, the wing aileron RC servo lead extension. This design came about, after the original system, failed. After quite a few landings, the landing gear struts spread wide and a major re-build was necessary. This design is standing up well and my landings can sometimes be harder than intended! 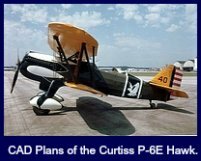 The model aircraft plans show these changes. These parts are quite easy to make. The aluminum was purchased from the local Lowes hardware store and tools required are a hacksaw, file and a drill gun or preferably a drill press. The 4-40 tap requires a core drill # 44 ( .086" dia.). Dubro packages the core drill and tap, in the same package. You will also need a center punch, to mark the hole position, prior to drilling. This photograph, is by Eitan Israeli, who has provided me with some great photos of his Fantome build. Here you can see all of the parts for mounting the landing gear as well as the lower wing mounting parts. The oleo struts were made by Century Jet Models and do look super! It looks as if Eitan used 2" angle and saved adding an 1/8" thick spacer, under the top left mounting hole. These components are made from standard parts, available from Sig Manufacturing. Buy the parts from sig and modify as shown on the drawings. If you order through this site, you will receive an e-mail order receipt from PayPal. 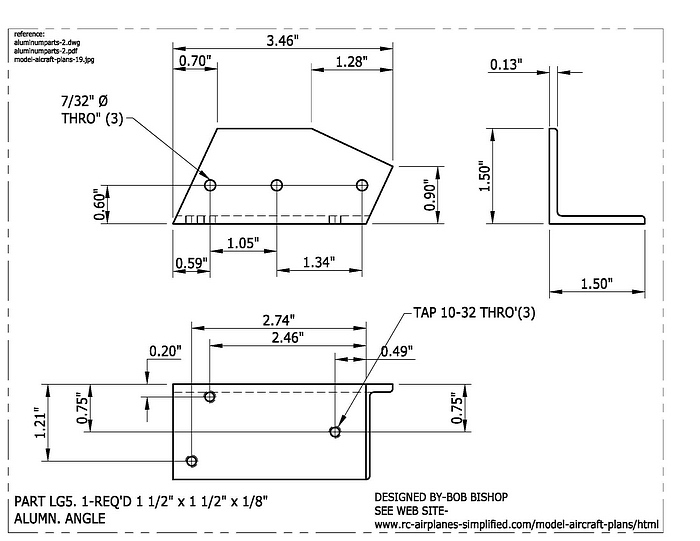 Shipping and handling of plans for orders within the United States APO- $12.50 USD. Shipping orders to Canada- $20.00USD. Shipping overseas orders- $28.00 USD. If you have any questions. please Contact Us. 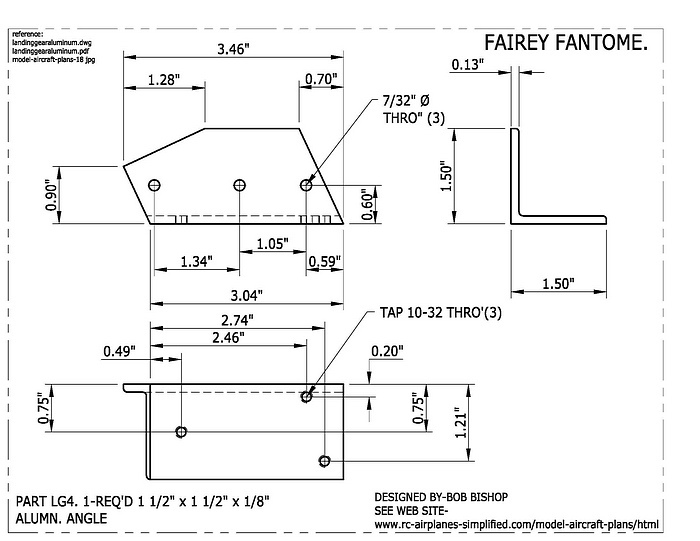 Price of 5 CAD drawn sheets of the 1/5 scale Fairey Fantome - $55.00 US plus shipping cost. Plans are also available in PDF format. You can take these files and plot them at your local print shop. I recently got a set printed at the local Staples store that had a wide (36 in.) format printer. I found them most helpful and I explained that I needed the plans printed exactly full size and they were able to do this after a few attempts. 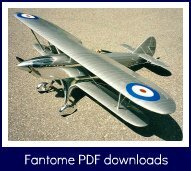 Price of the 5 sheets of the 1/5 scale Fairey Fantome, in PDF format is $25.00USD. 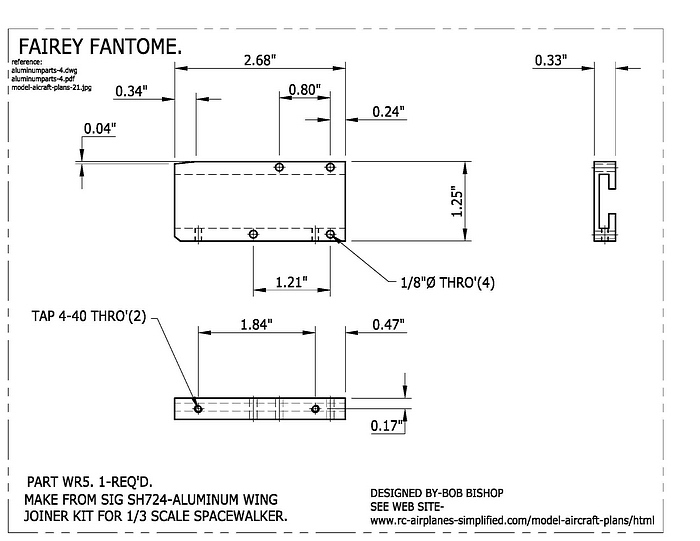 We now can supply a set of laser cut parts for the Fantome. Price of the set is $250.00 USD . 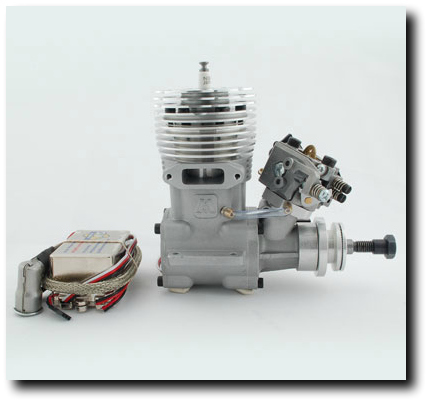 Parts are supplied by Bob Holman Plans- the premium RC airplane laser cutter in the U.S. 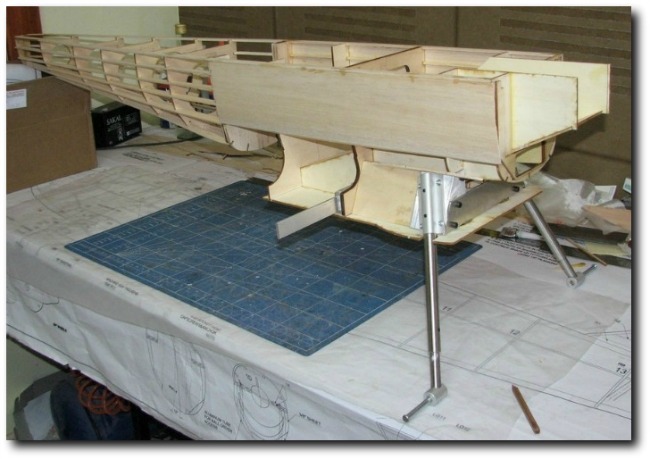 This set is a "short kit" of a large scale model aircraft and includes all the balsa and ply parts, laser cut to shape but no sheet or strip balsa is included. Note also that no hardware is supplied. 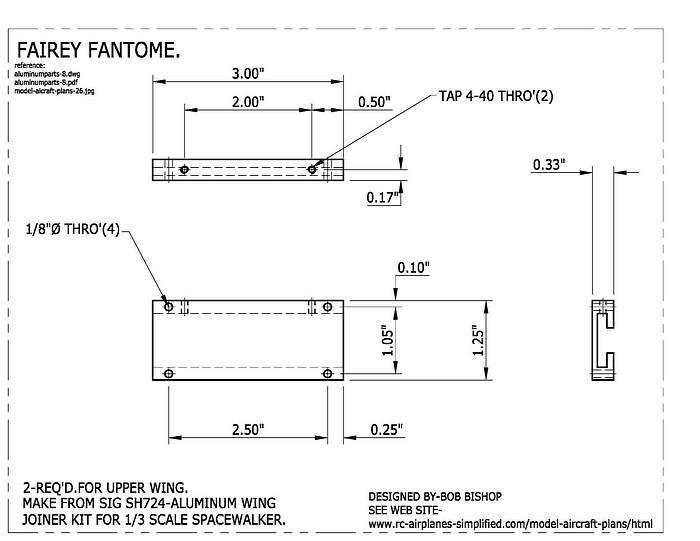 Please note that the Fantome uses balsa and ply construction for the cowl and wheel pants so no fiberglass parts are required. Please click here for the list.